LAS VEGAS, Nevada - January 5, 2016 - Creative Technology Ltd today announced at CES 2016 Las Vegas a brand new concept in advanced audio and video delivery systems: The Creative X-Fi Sonic Carrier. The elegantly-designed carrier system is a high-end lifestyle entertainment platform that brings together all the advanced technologies and convenience in a single beautifully crafted aluminum body. Powered by a whopping 7 processors with 14 cores, this technology powerhouse carries a 15.2 high-resolution audio system in a 11.2.4 (front.sub.height) speaker configuration that also incorporates Dolby Atmos® technology. Furthermore, the Sonic Carrier features an advanced video playback engine that supports 4K (60fps) local and streaming video content. The intelligence and features of the system can even be further upgraded in the future. The X-Fi Sonic Carrier also comes with 3 distinct wireless technologies that allow multi-room Wi-Fi, Bluetooth®, and a zero-latency speaker-to-speaker link to up to 4 subwoofer units. Aesthetically designed to fit into a high-end designer living space, the carrier exudes the presence of a well-crafted ultra high-performance audio system. The X-Fi Sonic Carrier features an immensely strong and acoustically inert double walled enclosure, painstakingly crafted with extreme precision on an extensively CNC machined, finely polished and anodized aluminum chassis in cool black. The X-Fi Sonic Carrier is the epitome of high-end home theatre and high-end audio systems, made for people who appreciate the finer things in life. It redefines the boundaries of the state of the art in the category. It is truly a work of art, said Sim Wong Hoo, Creator of the Sound Blaster and CEO of Creative Technology Ltd. 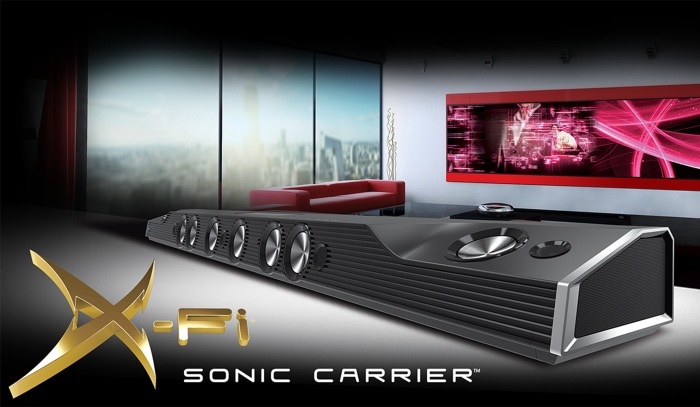 The groundbreaking X-Fi Sonic Carrier's 11.2.4 audio system incorporates the latest Dolby Atmos technology. Dolby Atmos for the home brings the ultimate cinema sound experience to your home theater to create powerful, moving 3D audio that flows around and above you. This will deliver the sensation of height to create an atmospheric, three-dimensional sound experience. Taking advantage of our in-depth knowledge of the way sound is perceived, the Sonic Carrier employs 4 upward-firing speaker drivers that perfectly reproduce the height information present in Dolby Atmos recordings by reflecting the sound off the ceiling and back down to the listener. This completes the surround sound performance delivered by the 11 front and side-firing speakers for a full 360° surround, three-dimensional audio experience. The X-Fi Sonic Carrier further incorporates Creative's own EAX 15.2 Dimensional Audio processing algorithms to deliver a new benchmark in extracting natural, spacious and enveloping sound from legacy surround and stereo material. The EAX 15.2 Dimensional Audio processing leverages Creative's decades of expertise in surround sound and signal processing to intelligently produce a natural sense of immersion, height and depth from the existing stereo and surround material. The resultant 15.2 signal is then individually DSP-processed, upscaled to 24-bit high resolution audio, and finally reproduced through the 11.2.4 channels of the Sonic Carrier. 11 front and side-facing channels deliver full-bodied mids and soothing highs, while a subwoofer channel delivers deep precise bass for a phenomenal all-round audio experience. With the Sonic Carrier's front and side-facing drivers spreading across the 55″ width of its body, it delivers an astoundingly wide soundstage that is unmatched by conventional sound bars. Furthermore, the X-Fi Sonic Carrier's spectacularly generous width matches 65″ (and larger) TVs perfectly. The Sonic Carrier is also appealingly slim at a mere 3.5″. The system comprises of 15 drivers in the Sonic Carrier main unit and a dual driver wireless subwoofer. Every driver in the system features low distortion motors and perfect pistonic behavior within its operating range for precise, detailed and uncolored sound. Every driver is also individually driven by a DSP-controlled amplifier for the ultimate in accuracy and control. And with 800 watts RMS total system power, it ensures a very high dynamic range output. The Sonic Carrier consists of 10 pieces of 2.75″ Aluminum Cone Midbass drivers and 5 pieces of 0.75″ wide dispersion Titanium Dome Super Tweeters. The super tweeters with extended high frequency response to 40 kHz are ideal for getting the best out of, high bitrate, high-resolution audio recordings. These drivers are arranged in an array with 11 front and side firing drivers reproducing front and surround sound, and 4 up-firing drivers reproducing a realistic sense of height. The subwoofer is connected to the X-Fi Sonic Carrier via a zero-latency wireless speaker link. The subwoofer unit houses two subwoofer drivers in a push-push configuration - providing the same surface area and bass output of a single 10″ driver, but with a much slimmer profile, and none of the unwanted vibration. A dual flared, bifurcated port tube loads each of the drivers equally for optimal performance. Consistent with the driver design philosophy of the Sonic Carrier, each subwoofer driver features a tremendously strong and rigid aluminum diaphragm, purely pistonic in behavior within operational bandwidth for precise bass reproduction. The diaphragm is driven by an extra long throw, low distortion motor system for deep and powerful bass. Bass quantity and quality could be upgraded phenomenally by adding up to 4 subwoofers wirelessly: averaging out response deviations, resulting in a bass response that is simultaneously smoother yet devastatingly powerful. Network audio protocols: including AirPlay® and Google Cast for audio, Miracast, Chromecast, and DLNA. Online music services: including popular online music streaming services such as Spotify®, Pandora® and more. Android-based video playback engine: supports up to 4K (60fps) video content playback, as well as most popular online movie streaming services such as: Netflix®, Hulu® plus, HBO GO®. The X-Fi Sonic Carrier is also VPN compatible so that users could watch their favorite content all over the world. Advanced X-Fi Pro Studio is a suite of adaptive audio technologies focused on giving users a 24-bit audio playback that is further enhanced by Creative's proprietary Xtreme Fidelity (X-Fi) algorithms. It works by analyzing the audio signal to understand the spatial and dynamic nature of the program material, transparently enhancing the audio signal such that the quality of almost any audio source could be improved. The level and extent of processing can be customized via software, available on PC, Mac, iOS or Android platforms. EAX 15.2 Dimensional Audio analyses, processes and reveals spatial cues in existing music and movies to provide a totally immersive listening experience. Unknown to many listeners, many existing stereo recordings actually contain enough recorded information about the recording venue's ambience, but existing stereo channel reproduction cannot effectively reproduce such latent information. EAX 15.2 Dimensional Audio uses frequency-domain processing to discriminate and localize multiple simultaneous spatially distinct sound events, in a manner analogous to the auditory system of humans; separating primary sound such as singers and instruments, from ambient sounds such as the acoustic contribution from the recording venue. The ability to understand the spatial content of a recording allows the Sonic Carrier to then allocate each performer or sonic event its place in the soundstage. The result: music and movies are brought into clearer spatial focus, and the sense of space and height latent in many recordings is revealed. X-Fi HD Crystalizer intelligently remasters your legacy audio material, freeing the audio from the constraints of the original, lower resolution mediums such as CDs and MP3s, conferring many of the advantages presented by high-resolution recording and delivery formats. X-Fi HD Crystalizer was created with the realization that in many instances, legacy audio content has been compromised in order to optimize the listening experience within the dual constraints of the 16-bit precision of CDs and MP3s, as well as the typical limitations of playback systems. Most audio systems on the market, regardless of claims of support for high-resolution playback, do not have the dynamic range needed to reproduce realistic musical dynamics. The Sonic Carrier, on the other hand, has ample dynamic range and detail resolution. This allows the X-Fi HD Crystalizer to restore and enhance legacy audio material to its full potential. This is achieved by analyzing the audio signal in real-time, distinguishing specific transient sound events that suffer from dynamic compression during the recording process, and selectively restoring their lost dynamics. The typical effect of this restoration produces crispier highs, punchier mid-range percussion, and stronger kick bass hits. X-Fi HD Crystalizer is particularly effective in improving the impoverished high-frequency sound of data-compressed audio, such as MP3s. It restores the highs and lows of music, giving users enhanced detail and clarity. It also intelligently upscales all output to 24-bit HD audio format. Volume levels can change dramatically within a playlist, between different source content, during transitions between television programs and commercials, between different television stations, and within a movie soundtrack. Yet the listener generally desires to have the volume they hear remain at a consistently comfortable level. Setting the amplifier volume control constantly can be tricky and frustrating. It needs to be set high enough to overcome background noise during quiet passages yet it also needs to be set low enough to avoid ear-splitting levels during loud passages. The patented X-Fi Smart Volume technology addresses the problem of changing volume levels by automatically and continuously measuring volume and smoothly applying gain and attenuation to compensate for those changes. X-Fi Smart Volume can actually look ahead of time at the incoming audio stream, determine the perceived volume level, and apply gain or attenuation just in time to compensate for a source volume change. X-Fi Smart Volume also includes a specially tuned Night Mode, designed to keep the dynamics of the audio track under control, i.e. it suppresses the loudness of the explosion but gains up soft dialog levels. The user is able to enjoy his favorite movie at night without disturbing his family or neighbors. The X-Fi Sonic Carrier is equipped with Room Calibration capability to intelligently adapt to the unique acoustics of any room it is in, so users can always get the best audio possible. This feature is needed because a room's construction, material and layout, as well as the speaker's placement in the room can alter speaker performance, affecting music and movie dialog clarity. With room calibration, the X-Fi Sonic Carrier adapts to your room's unique acoustic environment, to ensure that your speakers always sound like what we hear in our labs. The X-Fi Sonic Carrier supports state-of-the-art 802.11 b/g/n/ac Wi-Fi, as well as Gigabit Ethernet, enabling streaming and multi-room content delivery. 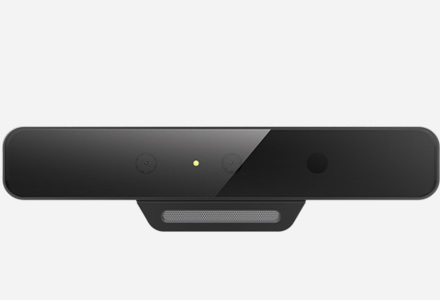 Beyond that, it supports a full range of inputs that covers the user's every need: Bluetooth audio, network audio and video, 2 analog inputs, 2 digital optical inputs, 4 HDMI 2.0a inputs, as well as 4 microSD card slots. Dolby Atmos delivers captivating, multidimensional sound that places and moves specific sounds anywhere in the room, including overhead, to bring entertainment alive all around the audience. Since its introduction in the cinema in 2012, Dolby Atmos has been embraced by all the major Hollywood studios, seven Academy Award® winning directors, and 16 Academy Award winning sound mixers, among others. Now, entertainment enthusiasts will be able to enjoy Dolby Atmos in their home theaters. A prototype of the Creative X-Fi Sonic Carrier will be demonstrated at the Creative Labs, Inc. Booth #30201 in Tech East, LVCC, South Hall 3, Level 2 at the 2016 International CES, which runs January 6 - 9, 2016, in Las Vegas, Nevada. It is now available for pre-order at an attractive crowdfunding-style price starting from USD1750 (excluding shipping and handling). This pre-order price will last until March 31, 2016 for a limited quantity only. Creative is a worldwide leader in digital entertainment products. Famous for its Sound Blaster® sound cards and for launching the multimedia revolution, Creative is now driving digital entertainment with cutting-edge audio solutions which include premium wireless speakers, wireless headphones, and powerful audiophile-grade amplifiers and digital audio converters. Today, Creative re-invents the Sound Blaster, which has a user base of over 400 million, with its ground-breaking Sound Blaster Roar and Sound Blaster X7 that aim at the new mobile networked generation by bridging the worlds of the computer, smartphones, and tablets. Creative's proprietary technologies, innovative hardware, applications and services leverage the Internet, enabling consumers to experience high-quality digital entertainment - anytime, anywhere. This announcement relates to products launched in the United States. Availability is subject to change without notice and may differ elsewhere in the world according to local factors and requirements. Creative, the Creative logo, X-Fi, the X-Fi logo, Sonic Carrier and EAX 15.2 Dimensional Audio are trademarks or registered trademarks of Creative Technology Ltd in the United States and/or other countries. All rights reserved. Dolby Atmos is a registered trademark of Dolby Laboratories. Android, Google Cast and Chromecast are trademarks of Google Inc. AirPlay is a trademark of Apple Inc., registered in the U.S. and other countries. Miracast is a trademark of Wi-Fi Alliance. Spotify is the registered trade mark of the Spotify Group. Pandora is a registered trademark of Pandora Media, Inc. Netflix is a registered trademark of Netflix, Inc. Hulu is a trademark of Hulu, LLC. HBO GO is a registered trademark of Home Box Office, Inc. Academy Award is a registered trademark of the Academy of Motion Picture Arts and Sciences. The Bluetooth® word mark and logos are registered trademarks owned by Bluetooth SIG, Inc. and any use of such marks by Creative Technology Ltd is under license. Other trademarks and trade names are those of their respective owners.